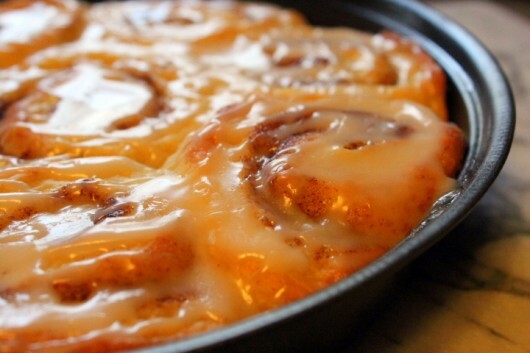 YES, I wrote about these sweet, sticky, sinfully delicious Cinnamon Rolls back in 2011. And today, because I’m taking pictures for my cookbook, and because I wanted something sweet, sticky and sinfully delicious for breakfast, I decided to make them again. Are you ready for a taste? Cinnamon Rolls begin their career as Sweet Roll Dough. 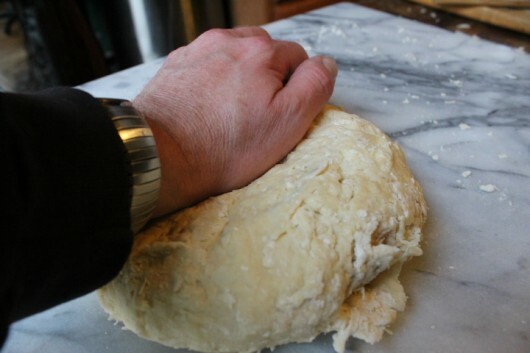 I knead this dough entirely by hand. If you’d prefer to let your standing mixer knead the dough, I won’t stop you. 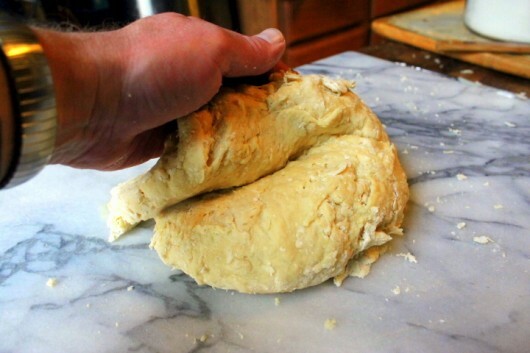 Tip: When you knead dough by hand, you don’t have to visit the gym. But you will still have to take your dog for a walk. Then add one 1/2 cup milk, which you previously scalded and then cooled to 110°. And then dump the mess onto your lightly-floured work surface. And then push it out again. 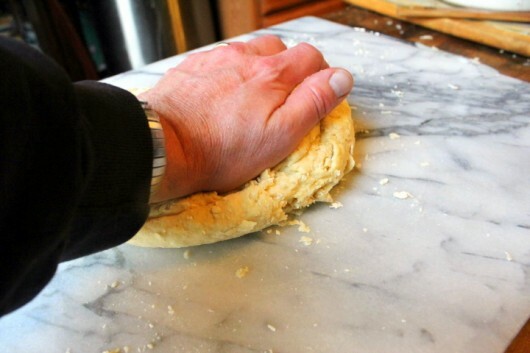 After 3 minutes of pushing and pulling, the dough will suddenly stiffen up, and resist your kneading-efforts. At this point, just let it rest for 2 minutes, to relax the gluten. Then knead for 2 additional minutes. 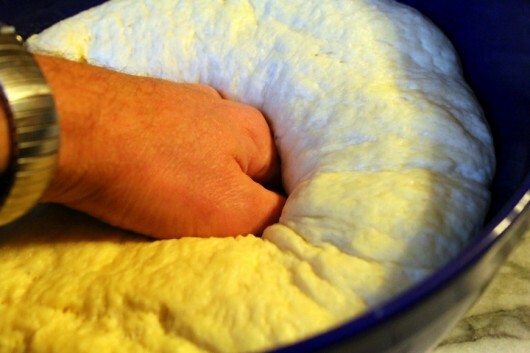 The dough is ready when it no longer feels sticky, and its surface looks smooth and silky. 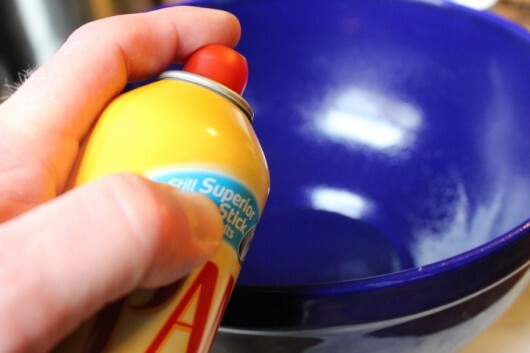 Quickly wash out and dry the bowl, and then spray it lightly with non-stick vegetable spray. Yes, I realize my dough looks like a chicken in the photo above. 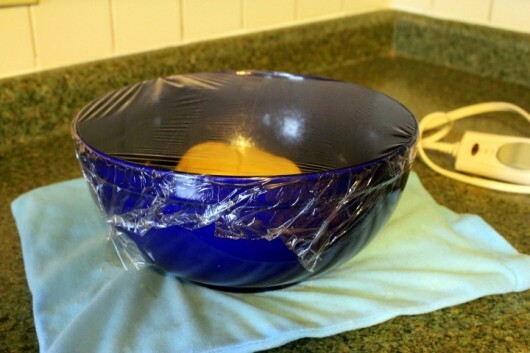 Cover the bowl with plastic wrap, and then set it someplace warm until it doubles in volume — about 1 1/2 hours. No warm spot in your kitchen? Then do what I do, and set the bowl of dough on a heating pad. You can buy this common device at any drug store for about $10. While the dough is rising, butter two cake pans, and then coat the bottom of each with granulated sugar. 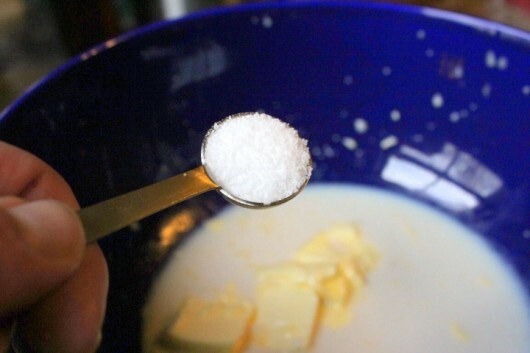 Use one tablespoon of sugar per pan. You might as well prepare the cinnamon-sugar filling, too. 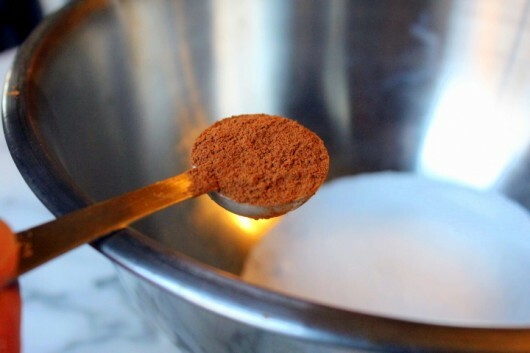 To do this, whisk together one 1/2 cup of sugar with 2 teaspoons of ground cinnamon. And then sprinkle the cinnamon-sugar evenly over the top. Working from the 15-inch side, roll the rectangle up as tightly as you can. 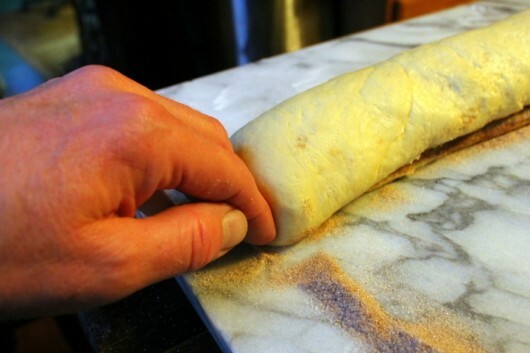 As pictured above, use the back of your hand to gently flatten each end of the roll. And then place the slices in the sugared cake pans. Cover with plastic wrap, and let the rolls rise until double — about 30 minutes. Bake the buns for 25-30 on the lower-middle rack of your preheated 350°F oven. While the rolls are still warm, drizzle them generously with glaze (2 cups confectioners’ sugar mixed with just enough water to make it pourable). And tuck into something that’s delicious, delightful, and devilishly-delectable. I hope you’re drooling right about now. Special Equipment — 2 cake pans, 9 inches in diameter, and 2 inches deep. 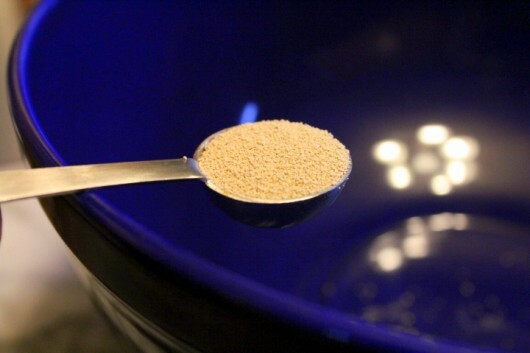 Making the dough – In a large bowl, dissolve yeast in warm water, and let it proof for 5 minutes. 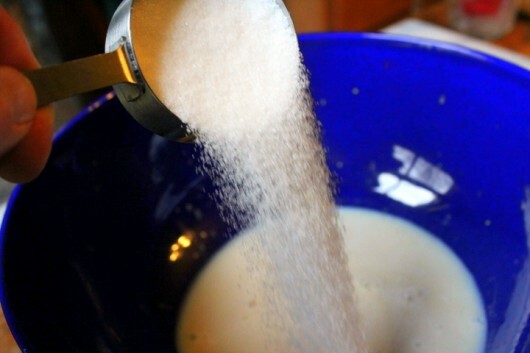 Add milk, sugar, butter, salt, egg and 3 1/2 cups of the flour; stir with a stout wooden spoon until smooth. 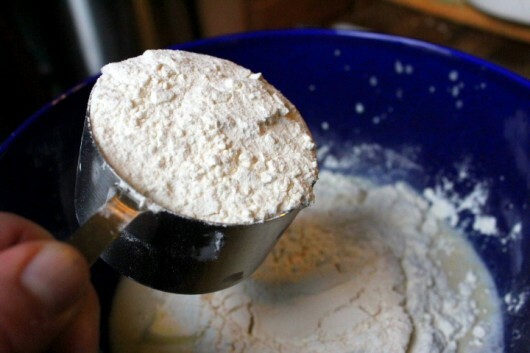 Then mix in enough of the remaining flour to make the dough easy to handle. 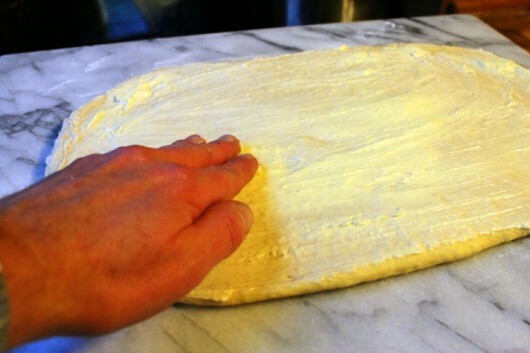 Turn the dough onto a lightly floured surface (I use a marble slab); knead until smooth and elastic – about 5 minutes. 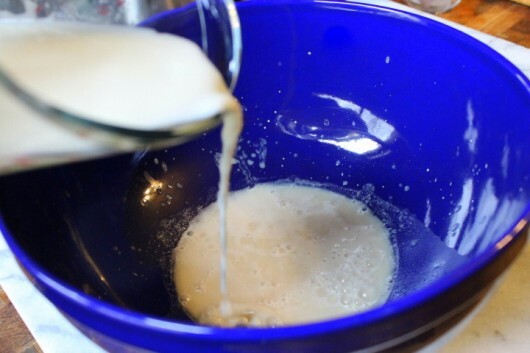 Quickly wash and dry the large bowl, and then grease it with oil or vegetable spray. 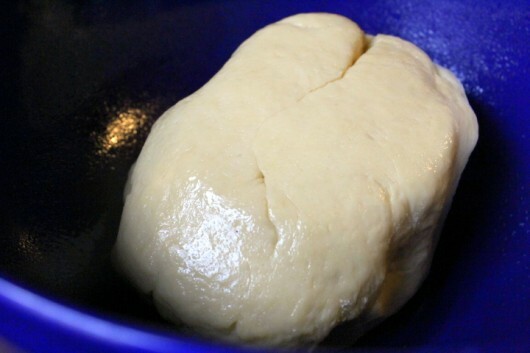 Place dough in the bowl; turn “greased” side up. Cover with plastic wrap and let rise until double, about 1 1/2 hours. 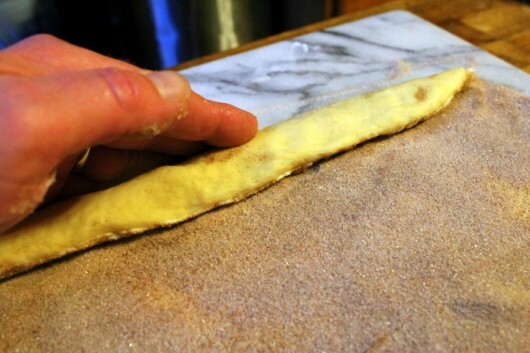 Filling and rolling the dough – Punch down the dough, turn it onto a floured surface, and then roll it out to form a 15″ x 9″ rectangle. 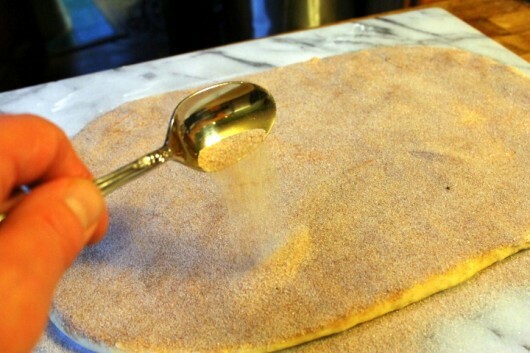 Spread the dough with the softened butter; sprinkle with cinnamon and sugar. Then roll it up tightly, beginning at the 15-inch side. Flatten ends with the back of your hand, and, if necessary, pinch the ends to seal. 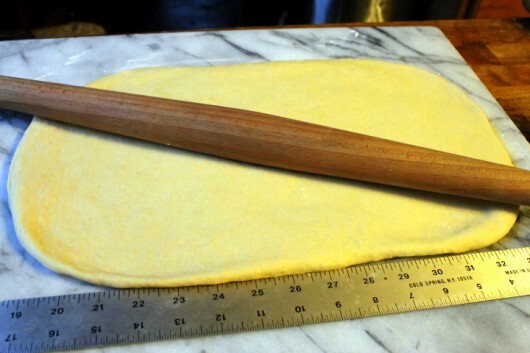 Cut the dough into 1-inch slices. Place the slices slightly apart in the buttered and sugared cake pans. I managed to fit 8 slices in one pan, and 7 in another. Let rise until double – 30-40 minutes. Baking – 25-30 minutes in a preheated 350°F. oven. Set the pans on the lower middle oven rack, and bake for 25-30 minutes, or until the rolls have slightly browned. 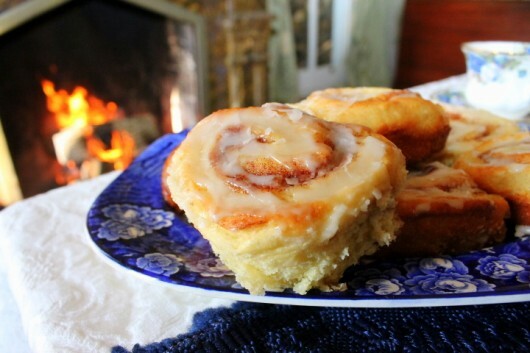 Don’t over-bake, or you’ll have crispy cinnamon rolls (this isn’t necessarily a bad thing). Set pans on a wire rack to cool slightly. 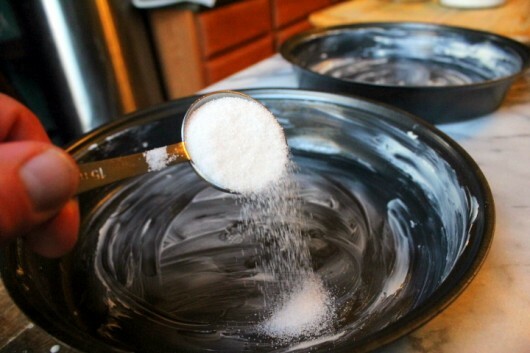 Glazing the rolls – Pour the confectioners’ sugar into a medium bowl. 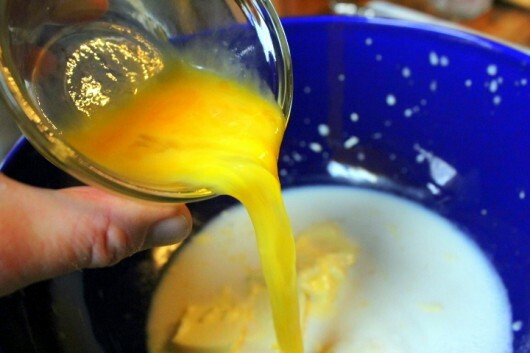 Whisk in hot water, one tablespoon at a time, until the glaze is thin enough to pour. Drizzle the glaze in between and all over the rolls. Folks, promise me you’ll make these dreamy rolls some day, okay? They are terrific for breakfast. And as an after-school treat, they can’t be beat! Monkey Bread – The Real Deal! I’m making these today, but adding leftover cranberry sauce to the cinnamon/brown sugar filling! Kevin,my grandson’s have been asking for these and grandma here cannot find a recipe that is clear , concise and I can understand it. thank you for this recipe. I will let you know how they turned out. Thank you fo r all the information that we have received from you. The tip on heating pads has turned out to be a really good one! I bought a heating pad so I could start making the pan de miel you posted a few months ago. Only problem was that I couldn’t find one that didn’t have an automatic timer. So….I traded my brand new one (w/ automatic timer) for my neighbor’s old-fashioned one that stays on forever and is probably a fire hazard. She was happy with the new one and I’m stoked about the old one. Use if to make yogurt, bread, and I guess now I’ll make cinnamon rolls! The magic of a cinnamon roll- turns the grayest winter morning into a special day!!!! These spirals of tender pastry and warm sweet cinnamon topped with sticky sugary glaze- delicious! These prove to be irresistible- especially when warm! Thanks for sharing Kevin! I was wondering if these can be made the night before, refrigerated and them baked in the morning? Linda – You can absolutely make these the day before. Let the rolls rise, then cover with plastic wrap and refrigerate overnight. Enjoy! Wonderful! I’m making them for a brunch I’m invited to tomorrow, and making them tonight and baking tomorrow will be ao much easiier! know everyone will love them. Thanks! Will your cook book be for sale at Barns & Noble? Terrific recipe once again. They turned out perfect. Thanks! These were dreamy! Devine! Delightful! Loved them!!!!! Hi! I am def going to make this! Thx!! Your china is so beautiful! An excellent complement to your lovely rolls. Would love to have a website & then would need to figure out how to get photos downloaded & posted. Having had a stroke (due to surgery to ‘clip’ an anneurysm on my brain), my brain isn’t “working” like it should nor used to. Thus I appreciate the simplicity of your directions. These look lovely but being English I need help, is all pupose flour plain or selfraising? Hi Ruth – In the U.K., all-purpose flour is the same as “plain flour.” Enjoy these treats! 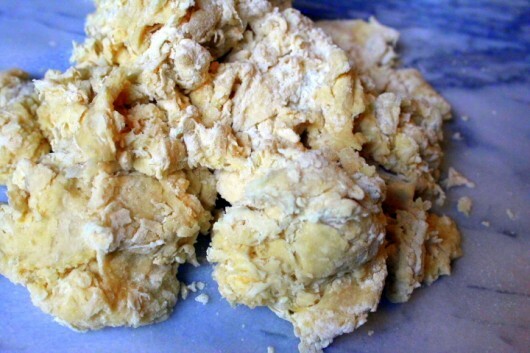 Question for Kevin: Can this Sweet Dough recipe be made ahead of time and frozen for Christmas Brunch? Please give me details of how to proceed. Thank you. How lovely they look and sound. I didn’t know about your upcoming cookbook. I’m excited to get it!!! And yes. I will make these. Probably today. Hi TriciaLee – I’ve no experience with freezing the dough. But…I’ve refrigerated the risen rolls overnight, and then baked them off the following morning. Delicious! Love that fancy, expensive rolling pin! My MIL used an old brown bottle and she was the best Pa. Dutch cook. Don’t know what the brown bottle was from but she used it for years. You are a neat cook..don’t see that you make a mess on the counter hardly. I bet they are yummy but I’m a lazy cook and have never made anything like that from scratch. Who’s has the gluten allergy, you or your partner? How do you manage to take photos and work with the ingredients at same time? Do you have a magic helper? I use unflavored plain unwaxed dental floss to cut up my rolls (slide the floss under roll to right spot, loop over crossing the strings as if going to tie a bow around the roll but keep pulling instead) – kinda seals the innards in and keeps the rolls round. Thanks for the tip about the heating pad! Great idea. 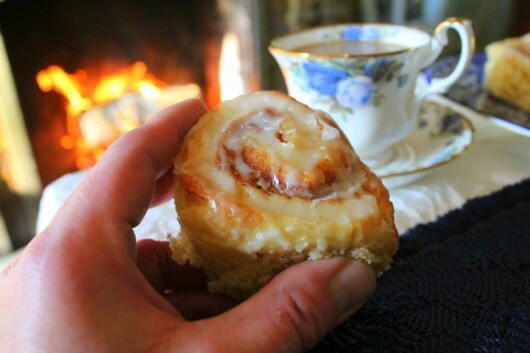 Love, love, love the smell of fresh baked cinnamon rolls! 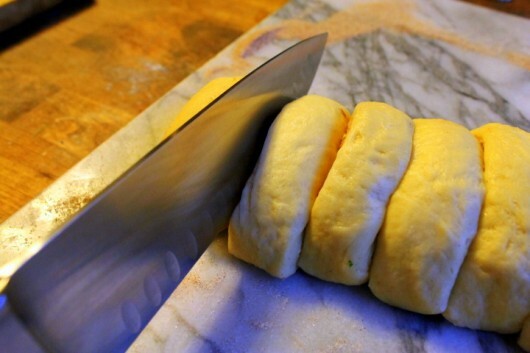 I don’t know if anyone else has mentioned this, but somewhere along the way I picked up this tip: instead of using a knife to slice the dough into rolls, use a plain piece of dental floss, about 15″ long. Slide it up under the long roll and pull the ends up and around, tightening and cutting off each piece. Because this method creates even pressure, each cinnamon roll stays round, instead of getting a bit flattened by a knife. Evelyn & Theresa – Love the dental-floss idea! 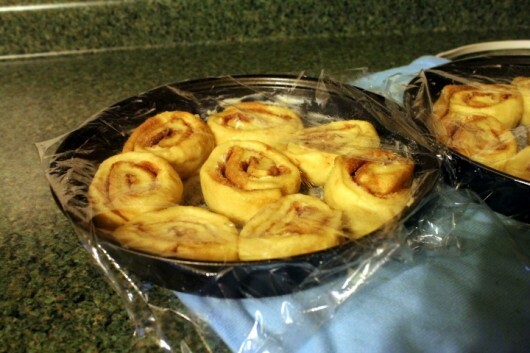 cant wait to try these, have a fake cinnabon recipe that is too sweet and takes too many steps! 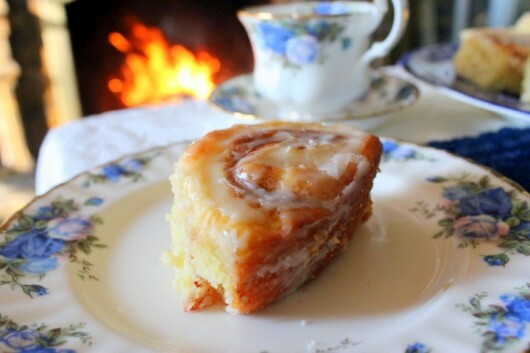 its snowing in eastern PA like crazy and hubby is outside fighting putting the plow on….its going to go to rain but he insists….so he will appreciate cinnamon rolls! oh dear, now i have to go help….. I just made these Kevin, and they were easy to make and absolutely delicious! My family and I LOVED them! Thanks! You have awesome recipes! I can’t wait for your cookbook! These look wonderfully delicious. Can’t wait to try. Thanks for sharing again. What if my bowl isn’t blue? Oh, I so long for cinnamon rolls! If you ever find a delicious gluten-free version, I’d be eternally grateful! The photo of the finished product, poised on the plate, makes me want to climb into the computer! Great job on these photos! Hi Kevin……The rolls look so good…will make them soon. 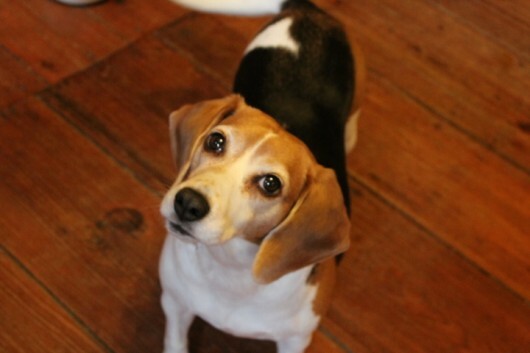 Loved the pic of Lily……she is a cute dog and much loved I’m sure. Thanks for all the great receipes. Looks like the house may be smelling of cinnamon pretty soon. Terrific pics and instructions~~thank you! Wonderful! 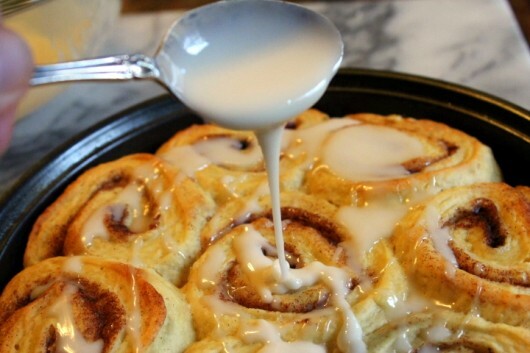 Cinnamon rolls are a nice treat! in addition to your heating pad for raising— the clear plastic zippered bags that blankets come in make a perfect atmosphere for yeast breads and yogurt making. have been using that combination for a very long time with a 20 year old heating pad and have yet to set anything on fire. 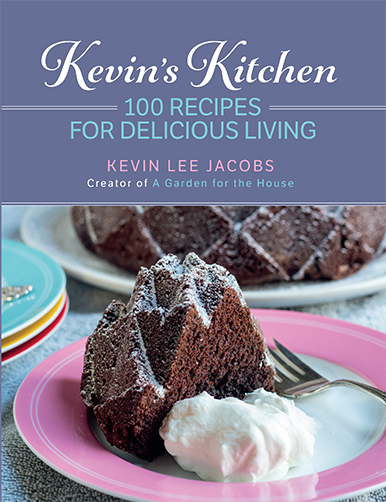 kevin -your offerings are as always beyond compare..b.
I love your wit, I adore Lily the Beagle, and I am excitedly waiting for your cookbook!! Like the heating pad idea. I put my dough in an ice chest with two inches of warm water to provide warm heat (does this make it a dough sauna chest?). 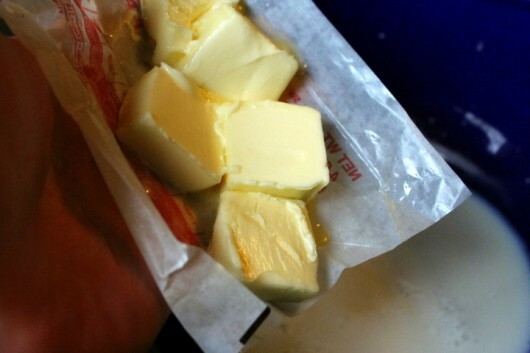 Put your bowl of dough covered with plastic wrap in the ice chest and shut the lid. 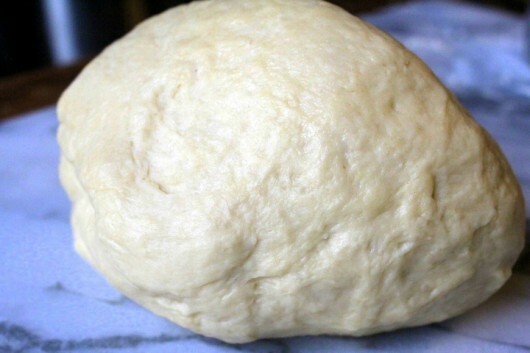 Your dough will rise. I LOVE cinnamon rolls, but find that if I want them warm for breakfast, I have to get up at some ungodly hour… boo! Do you have any experience with ‘overnight’ rolls? I’ve seen them but haven’t tried any yet, I’d love to find a good recipe that I can put together the night before, then just throw them in the oven when I get up. Hi Jesica – See comment #22! Oh Kevin. You and your “sinnamon” rolls got me in so much trouble yesterday!!!!! Was in a baking mode because of being iced in for a week and just glad that pantry was well stocked with baking supplies. Saw your recipe and it sounded so good and comforting that I just HAD to try it. I added just a hint of Fiori Di Sicilia flavoring from KAF. Your recipe is so easy to make and so delicious – my hubby has requested that I make them every week and wondered where I got the recipe. He now has requested that I make some more goodies from your site!!!!!! Love your site, pictures and your home!!!!!! Thanks for posting. I’ve tried bunches of different recipes searching for an easy /delicious dough. My husband loved the it! (“soft and yummy”). It’s a keeper! 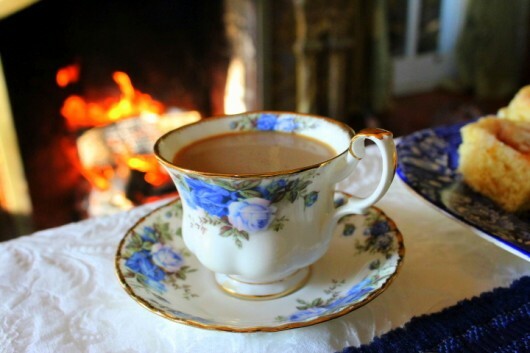 I just came in from your garden tour and I’m sitting by the fire with the brandy – I’m damp, I’m exhausted, I’m thawing out, and I”m happy wearing the slippers and shawl you found for me. What a wonderful host you are, Kevin! I can smell dinner cooking and I’m in bliss. Much happiness to you and all your household this Christmas! 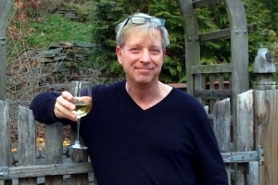 I’m so happy to give an angel their wings today… who knew it was so easy? Such fun to follow your site. I have tried several recipes and enjoys having the photos that go along and fine them very helpful. I do have a question about the Spinach,Fennel, & White Bean Gratin. Is there a way to make this ahead and maintain the fresh out of the oven taste? I made it to take for a Christmas dinner I was taking to a friend and his mother. I enjoyed the dish but the note “serve at once” limits this if there is a delay of any kind. Any suggestions? They are in the oven!!!!!!!!! great recipe. But I’ll own up to my ‘cheats’. Firstly, I do the dough in the bread-maker on the ‘dough’ setting. Secondly, for the frosting, I heat a container of cream cheese frosting in the microwave until it’s pourable, then drizzle it over top…. I just made these at my sister’s house for Easter…and her family “Hoovered” them down in no time! (There were, like, 2 or 3 left when I left the next day…not really worth taking with me.) Guess they were good! Thanks again for all the recipes (especially baking stuff…). Nothing smells better than these baking, I use light brown sugar and cinnamon for the filling, don’t know why…..just always have. What type of GF flour would you use to create these sinful delights for my Gluten Intolerant love ones? made these a few weeks ago- delish right out of the oven! I added some chopped walnuts to mine, too. thanks kevin! I will make these to take to a party next weekend!!! Can’t wait for your cookbook, though I already have a lot of your recipes in a loose leaf binder! !